we spent memorial day monday at home. it was a super productive day with countless hours spent outside working on our yard and our flower beds. we sure worked up an appetite doing all of that yard work outside in the hot sun. we both had a hankering for pizza, so we decided to take a break from our yard work and make pizza for lunch. 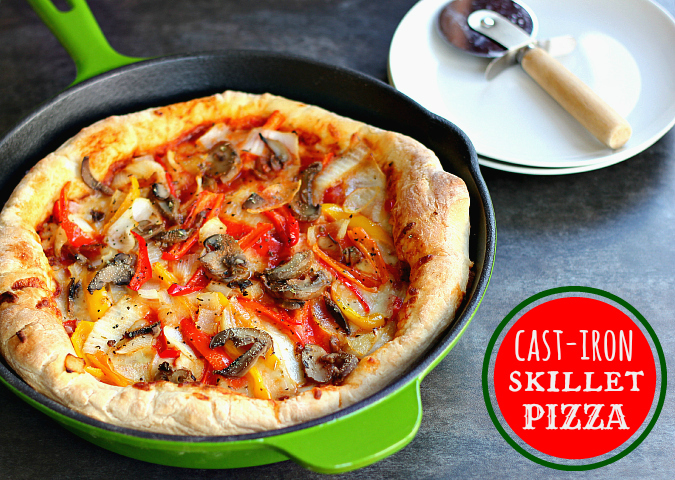 we had never made pizza in a cast-iron skillet before so we thought we would give it a shot to see how it worked, and it turned out great! the result was a delicious deep-dish pizza with a fabulous crust that was crispy on the outside and fluffy on the inside. we topped our pizza with marinara sauce, tomatoes, lots of cheese, and sauteed onions, peppers, and mushrooms. the flavors worked together so well. we made two pizzas and polished off a whole one between the two of us for lunch. (i guess working outside really did make us hungry!) we saved the second one and had the leftovers last night for dinner. it reheated perfectly in the microwave. we loved baking our pizza this way and can't wait to make it like this again. 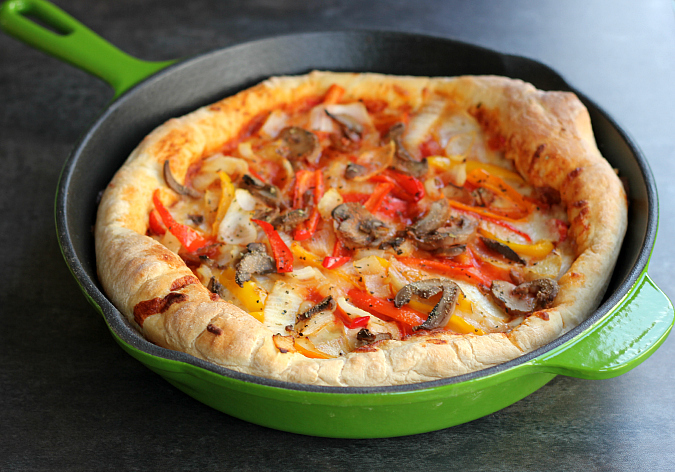 if you're looking for a different twist on traditional pizza, give cast-iron skillet pizza a try! saute the sliced onions, peppers, and mushrooms in butter in a pan over medium heat until the onions are soft and translucent. remove from the heat and set aside. allow the pizza dough to come to room temperature (if previously refrigerated or frozen). preheat your oven to 475 degrees F. separate the dough into two parts and roll the dough out into two 12-inch circles. grease two 12-inch cast-iron skillets with extra virgin olive oil and place the dough in each greased skillet. bake the dough for 5 minutes. remove the skillets from the oven and spread 1/2 cup of shredded cheese on the bottom of each crust. divide the marinara sauce between the two pizzas, spreading it on top of the cheese. slice each grape tomato in half and divide the tomatoes between the two pizzas. spread 1/2 cup of cheese over each pizza. 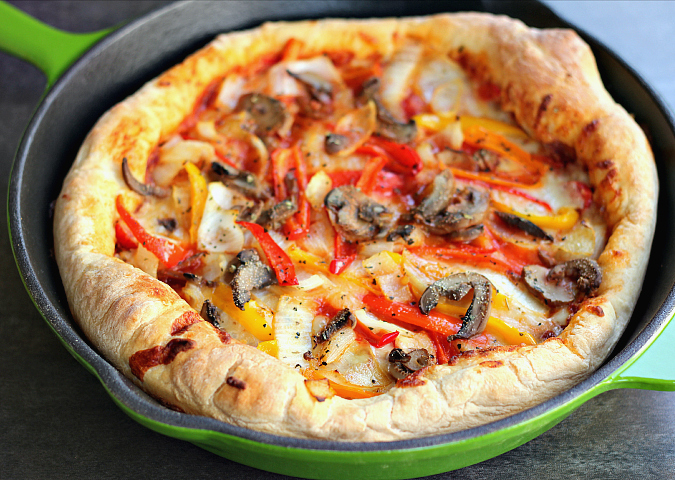 divide the sauteed vegetables between each pizza and arrange on top of the cheese. sprinkle with seasonings of choice (i used dried basil, dried oregano, and garlic powder). bake for 15-20 minutes until the cheese is melted and the filling is bubbling. serve warm. This pizza looks really good. I will have to give it a try. I only have one skillet so I would have to make it twice or make one on a pizza pan. Good idea! That really looks tasty. I will have to check to see if I have a pan like that from Ellie.